Usually, creating a realistic watercolor dip look takes a ton of time and practice - not to mention making a huge mess all over your studio. With the new Ensō Collection from Pilot Pen, all of this is as easy as 1 - 2 - 3 (okay, there are technically 6 steps, but they’re really simple ones!). All you need is some heavy cardstock, a paintbrush, water, and of course the Watercolor Brush Pens from Pilot. They come in a lot of gorgeous colors, but we chose to work with the Hot Pink because we love bright colors! These would also be a great fit for a fun holiday coming up - celebrate Galentine’s or Valentine’s day with this romantic ombre look. Alright, on to the DIY! Cardstock, cut down to size. I’d recommend watercolor paper! A Paintbrush. Smallish is good, but it doesn’t matter too much what size. Like...really wet. The wetter the better for this particular project. Apply your wet paintbrush on one card at a time for the best results. We want to keep that water flowing as much as possible. Paint 2-3 stripes at the bottom of the place cards, trying to paint as close to the edge as possible, or over the bottom edge. Here’s where the magic happens - touch your Watercolor Brush Pen onto the very bottom edge of your card, and draw a line across that edge. You may need to draw another line a little higher up, depending on how far your water went up. That’s all it takes, really. You have a lot more control over where the ink goes with one of Pilot’s Watercolor Brush Pens, rather than normal watercolor paints, which is what I really love about this project. And the chances of making a mess are significantly slimmer - perfect for someone like me, who can make a mess out of pretty much anything! Step 4: Watch the magic happen! Now it’s time to Oooh and Aaah over that beautiful watercolor dip effect you’ve created. You may need to add more water or more ink to your card, depending on how it all interacts. The best part is that it’s completely up to you! I recommend giving the ink some time to really spread out in the water before you try to add more or play with it - watercolor is an art in itself, and it’s best to let the ink do what it does best. Give your cards about 30 minutes to an hour, until they’re fully dry to the touch. You don’t want to mess up all the beauty you’ve created! The look of the watercolor will also change as it dries - we recommend doing a few extra, so you can choose your favorite ones after everything settles. 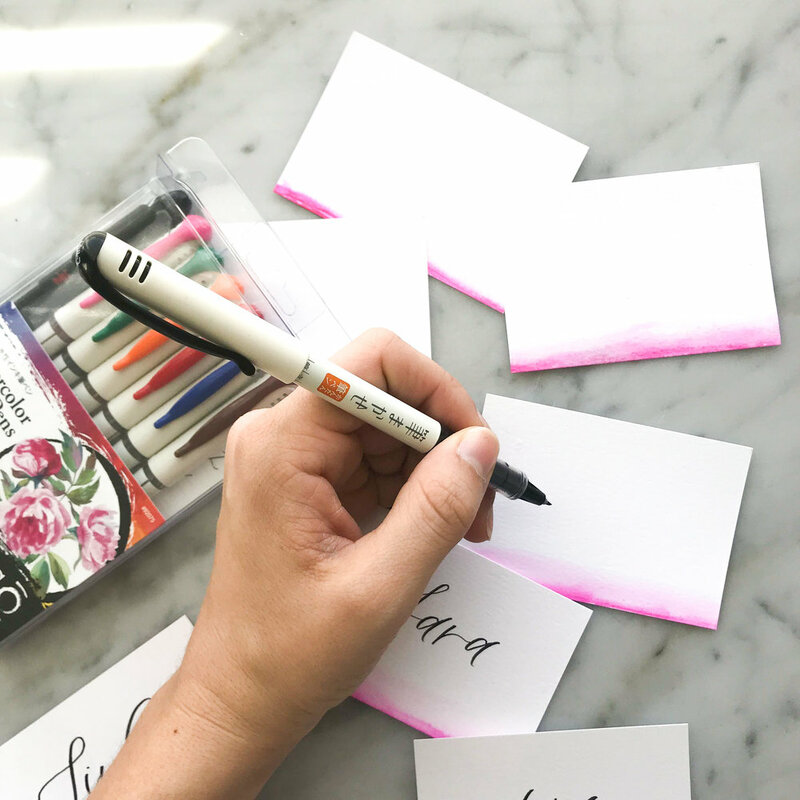 All the kits in Pilot's Ensō Collection come with an included lettering guide in each package, so if you’re not familiar with hand lettering, you can use that to practice! Writing names in pencil first will help you space everything out. You will likely love writing with these pens - they’re definitely some of the best fine-tip brush pens I’ve ever written with. Pilot includes a broad tip brush pen in your pack (in black) so you can use that if it’s most comfortable for you. On smaller pieces, like place cards, I tend to prefer writing with the fine tip pens. We used the black fine tip pen here for writing our friends’ names, but you can use whichever color you like! ...and that’s it! The best part of using these Watercolor Brush Pens instead of real watercolors is that you have little cleanup. Simply snap the cap back on, and you’re ready to go! It’s a great substitute for your current watercolor projects, or a good place to start if you’re just learning about watercolors! There are honestly a million other projects we have in mind for these brush pens, and can’t wait to use them! Thank you to Pilot Pen for kindly sponsoring this post. All opinions are 100% honest & completely my own.